Some Dojo hold classes which are devoted almost exclusively to training with the JO (Staff), TANTO (Knife) and BOKKEN (Wooden Sword); the three principal weapons used in Aikido. However, since the goal of Aikido is not primarily to learn how to use weapons, trainees are advised to attend a minimum of two non-weapons per week if they plan to attend weapons classes. There are several reasons for weapons training in Aikido. 1 Many Aikido movements are derived from Classical Weapons Arts. There is thus a historical rationale for learning weapons movements. 2 Weapons training is helpful for learning proper Mai-ai, (distancing). 3 Many advanced Aikido techniques involve defenses against weapons. In order to ensure that such techniques can be practiced safely, it is important for students to know how to attack properly with weapons, and to defend against such attacks. 4 There are often important principles of Aikido movements and technique that may be more easily demonstrated by the use of weapon than without. 5 Training in weapons KATA is a way of facilitating understanding of general principles of Aikido movements. 6 Weapons training can add an element of intensity to Aikido practice, especially in practicing defenses against weapons attacks. 7 Training with weapons provide Aikidoka with an opportunity to develop a kind of responsiveness and sensitivity to the movements and actions of others with in a format that is usually highly structured. In addition, it is often easier to discard competitive mindsets when engaged in weapons training, making it easier to focus on cognitive development. Finally, weapons training is an excellent way to learn principles governing lines of attack and defense. All Aikido techniques begin with the defender moving off the line of attack and then creating a new line (Often a non-straight line) for application of an Aikido technique. THE JO The Jo is a wooden Staff approximately 4ft in lenght and no more than an inch in width. It is a weapon that can be used both for thrusting and striking. There are many Katas used (Kata) is a set of pre-arranged movements which are used to defend against one or more attacks. As well as Kata there are sets of movements called Suburi. (Suburi) are unlike Kata in the sense that these movement are a set of more than one movement in a single on-set. It is both possable to use the Jo as an attacking and defensive weapon. In Aikido one can use the Jo to throw or put a lock on your partner. If you are attacked with the Jo you can turn the tables on your partner by using the Jo against him/her or, if you are using the Jo to defend yourself you can still use the Jo to nutrulise the situation. I find the Jo an extremely useful weapon as when I have conected myself when being attacked with the staff I can then control the attacker, because, even if you do not see at all, by using the Jo staff as an extention of my hands I can continue the defence as if he or she has hold of me. Like wise, if I have the Jo staff in my hands and my partner takes hold of the other end the situation would be the same as just previously stated. THE BOKKEN The Bokken (Wooden Sword) is a very important part of Aikido training. Many movements used in Aikido are derived from the movements of the Japanese Sword. As with the Jo (4ft Staff) the sword has a number of Suburi and Kata Movements. Once the basic 7 Saburi have been learnt the study of sword work can then be done safely. One example of how useful the sword is to an Aikidoka’s training would be in the use of Happo Giri (8 Direction cutting) to cover all possable sides of attack an Aikidoka must be able to defend themselves in any direction. The 8 Direction movements were formed to develop both the footwork and awareness. There are many variations of this exercise but the cutting action and footwork are usually the same. It is also a useful tool for learning distance Balance and timeing. The student and advance Aikidoka learn to defend themselves against Sword cuts (Empty handed) so the ability to move out of the way of the cut and yet be near enough to be able to deal with the situation is very important. It is obvious that as with the Jo safety is extremely important so care must be taken when using both weapons. THE TANTO (Practice knife) The Tanto is an important part of Aikido training as it adds reality to the practice of aikido. It is essential to be able to avoid being stabbed or slashed with the blade therefore, proper judgment of distance and timeing would need to be developed. 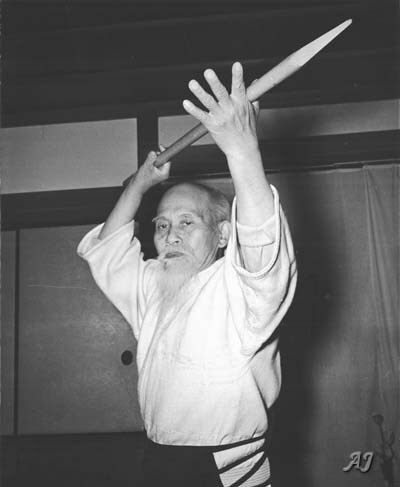 I do not bring the tanto in to training time until the students have a good understanding of tai sabaki (body movement) and some good understanding of techniques. By the time the student is about 2nd or 1st Kyu, I would expect him/her to be able to defend themselves against basic knife attacks. THE HUMBLE CANE….? I am now including the Humble cane as part of Aikido weapons training. Although, I have much more research to do on the subject I feel that movements that are used in Aikido Training could be addadapted to cane defence. From my stand point as a Blind person I am hoping to develop a complete system that people without sight and those with a little sight could learn and use in an emergency. After all, we carry a cane in our everyday life and why not use it as a legal weapon if required. Although, I use a Guide Dog to get about. I always have a cane within reach for any emergency that may arise. For example, My Guide Dog may not be feeling well and I may need to get about or it is slippery outside and the rubber tip can be used to help stay upright. More development is needed and I am in the process of getting things sorted. For more information of the cane and my development on the subject please look on the Aiki Cane link on the welcome page. I’m a 2nd degree black belt in TKD. I enjoy reading your blog. I am still sloppy at dealing with weapons but trying hard. Great site very interesting article, i’d be very interested in what you come up with concerning the visually impaired practice.